Rotator Cuff Tendinopathy, according to Lewis et al , "refers to pain and weakness, most commonly experienced with movements of shoulder external rotation and elevation, as a consequence of excessive load on the rotator cuff tissues". The patho-etiology of rotator cuff tendinopathy is multifactorial and can be attributed to extrinsic and intrinsic mechanisms, as well as to environmental factors. Rotator cuff tendinopathy is not a homogenous entity because of the diverse nature of the factors involved and hence, different treatment interventions are required, which take these specific mechanisms/factors into account. A prevalence of up to 30% of the population experience shoulder pain in their lives and up to 50% of the population experience at least one episode of shoulder pain annually. We can say that shoulder disorders are extremely common. 54% of people with shoulder disorders reports symptoms are still present after three years. Rotator Cuff Tendinopathy is seen as the most common type of shoulder pain as it is seen in about 30% of the overall population. There is an increased incidence of shoulder pain in individuals who participate in repetitive overhead activities including repetitive throwing sports like baseball or volleyball, occupations such as painting or carpentry. Rotator Cuff Tendinopathy incidence also increases with age, which needs to be considered when we talk about Rotator Cuff disorders. The following conditions can be grouped under the term Rotator Cuff Tendinopathy: "tendinitis, tendinosis, paratendinosis or partial tears of the Rotator Cuff tendons" and should exclude: "subacromial impingement syndrome, subdeltoid bursitis, adhesive capsulitis and full thickness tears". According to Lewis et al the definitive cause for Rotator Cuff Tendinopathy remains uncertain but proposed mechanisms include intrinsic, extrinsic or combined factors as can be seen in Figure.1 below. The symptoms or characteristics of rotator cuff tendinopathy are pain in the area of the four rotator cuff tendons and tenderness located in the shoulder-joint with a dull character, especially with overhead reaching, reaching behind the back, lifting, and sleeping on the affected side. More relevant in elevation of the shoulder and abduction, unable to reach higher than 90° abduction, anteflexion of the upper arm. The ADL can cause quite a bit of pain. The pain is not sudden but will gradually increase and is been there for some time. Associated with pain is the growing weakness of your shoulder and inability to move. There could also be a local swelling. Diagnosing is based on several aspects like the history of the patient. In addition, tests will be used to implicate an isolated structure. The diagnose of a rotator cuff tendinopathy will be achieved, based on the response to the clinical tests. Supporting examinations like ultrasound, radiographs, radionucleotide isotope scan, magnetic resonance imaging (MRI), computed axial tomography (CT), electromyography, nerve conduction, single photon emission computed tomography, diagnostic analgesic injection and blood tests are sometimes used to strengthen the diagnosis. Diagnostic ultrasound is considered the best tool to diagnose Rotator Cuff Tendinopathies , partial thickness tears, thickened subacromial bursa and rule out a full thickness tear. An MRI-scan can also be used to diagnose Rotator Cuff tendinopathies and partial rotator cuff tears. An Visual Analogue scale is used to describe pain in the shoulder-joint after the joint is palpated by the physiotherapist. This is not the only one, you can also use the Shoulder Pain And Disability Index (SPADI). A questionnaire filled in by the patient. Two clinical test can be performed to assess Rotator Cuff tendinopathy. The first is called the “Empty Can test”. The patient stands up with his shoulders in 90°abduction, 30° horizontal adduction and in complete end of rotation. The therapist fixates his hands on the upper arm of the patient and gives downward pressure while the patient tries to maintain his position. In the “Hawkin’s Test”, the patient is standing up with the shoulders abducted in 90° and internally rotate the forearm. The presence of pain with movement is an indicator of a possible pathology. With the modified Belly Press Test the patient stand or sit with the affected hand flat on the abdomen and elbow close to the body. The patient need to bring the elbow forward and straighten the wrist. the final belly-press angle of the wrist need to be measured with a goniometer. A belly-press angle difference of 10° between affected and unaffected side indicates a tendinopathy. There can be different treatment used in medical management. But not all are strongly evidence based. The use of non-steroidal anti-inflammatory drugs (NSAID’s) like ibuprofen and aspirin may have a pain reducing effect. As a second option you have the corticosteroid injections which are a commonly administered treatment for tendon disorders. It has side-effects like skin atrophy, over-sensitivity at the place of the injection and discoloration of the skin. Repetitive injections will also weaken the structure of the tendons. Medical examiners often prescribe immobilization. And the last medical management is surgical treatment, very good results were achieved with surgery, but will only be chosen if conservative treatment doesn’t work. The effect of of subacromial corticosteroid injection is sustained by the available evidence, although the effect may be small and short-term. Furthermore, it wouldn’t be better than NSAID. Also the effects of localized microwave diathermy on disability, shoulder function and pain are equivalent to those elicited by subacromial corticosteroid injections. Furthermore, the injection of platelet-rich plasma also proves to be effective for significant improvement on pain, function and pain outcomes. Physical therapy of rotator cuff problems reduces pain and swelling of the tendons, gaining again your normal range of motion and eventually strengthening of the shoulder. The first step before the actual treatment is rest and putting ice on the affected shoulder to decrease pain. It’s very important that in the beginning the patient avoids activities that increase pain and symptoms. The physiotherapist should guide the patient on when to resume these activities again. Studies have shown that other interventions like laser-and ultrasound therapy don’t support the effectiveness of therapy progression. posterior capsule stretching: reach with your affected arm across your body and use the other arm to pull the affected arm closer to your body. When the symptoms allow (5-6 weeks) depending from patient to patient, you can begin by giving strengthening exercises. Rotator Cuff Tendinopathy indicates a problem with your shoulder muscles. It can be caused by an overload of the four muscles located in that region, or an inflammation of one of the tendons. Other causes of a tendinopathy can be found in impingement of the bursa and calcification of the tendons from the rotator cuff muscles. 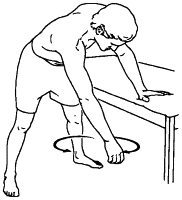 Upon external rotation the patient also lies on his back on the table with a cane in his hands. The elbows are bend in ninety degrees. Just like in the other exercise, it’s the unaffected arm that moves the other arm in external rotation. For abduction the patient moves the cane as far as possible away from the body without compensation. You can make this exercise more difficult when you ask the patient to lie on a 45° support or to perform the exercise in a standing position. The frequency of every exercise is 2-3 times a day, every day. 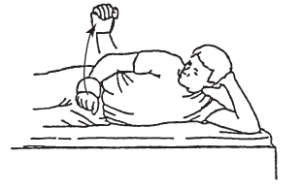 The patient progresses to isotonic and light closed chain stability exercises. The internal and external rotators are strengthened by utilizing said motions with the arm below shoulder height accompanied by elastic resistance and a towel roll placed between the arm and trunk to encourage proper technique, thereby minimizing substitution patterns. For training the M. serratus anterior you perform the bear hug exercise. You stand with the back toward the wall, knees slightly bent, and the feet shoulder-width apart. You flex your elbows to 45°, the arms are abducted 60° out from the trunk, and the shoulder is internally rotated to 45°. The patient then performs horizontal adduction of both upper extremities, following an imaginary arc at approximately 60 degrees of elevation until they obtain maximum scapular protraction by touching their fists together as to mimic a hugging motion around a cylindrical object. Afterwards you return to starting position. For strengthening the trapezius and rhomboid musculature you perform the sport row cord exercise. You stand still and pull the cords till you form 90° with your humerus, which directs downwards, and your radius and ulna, which directs forward. When you start with these exercises the remodeling phase is almost complete, and the rotator cuff tissue is almost mature. The patient should be pain free with activities of daily living. In addition, the patient must not show dyskenisia when performing active motions at multiple angles. Progressive strengthening of the posterior rotator cuff muscles, is accomplished by performing an exercise. You stand in a standing position, while performing external rotation of the shoulder at 45 degrees of abduction utilizing elastic resistance. By performing this exercise you ensure high levels of activation of the Teres Minor and the Infraspinatus. The supraspinatus muscle is optimally generated, by perfoming external rotation at 90° of abduction. To strengthen the serratus anterior further, you perform an exercise standing, facing away from the elastic resistance attachment with the hands held at shoulder width and chest height, holding onto the resistance band or cord. Next, the upper extremities are extended forward away from the body similar to a bench press motion at approximately 120°of a forward elevation followed by protraction of the scapula. In addition the push- up with a plus progression strengthens the serratus anterior even further. It begins with gradually increasing the gravity resistance. It starts by pressing against a wall, then an edge and eventually the floor. The patient stabilizes their upper extremity in a position of 90° of external rotation and 90° of forward elevation in the scapular plane. Once in this position the patient must maintain this position against elastic oscillations with a rubber bar. Additionally, advanced closed chain stability exercises are performed in the quadruped position, while stepping on and off steps of various heights and angles. Propioceptive neuromuscular facilitation can be implemented to continue the progression of rhythmic stabilization. Resisted isometric shoulder abduction (or lateral rotation or flexion etc) against a wall, or resisted shoulder abduction from 0°-30° using moderate resistance from Theraband. Resisted shoulder abduction from 80 to 120° using light weight, e.g. tin of food. Resisted shoulder abduction from 80 to 120° with progressively increasing repetition and weight, e.g heavy Theraband or dumbbell. Final assessment to identify any non-resolved functional limitations and progress loaded exercises as required, e.g. press-up, pull-up. ↑ 1.0 1.1 Lewis J, McCreesh K, Roy JS, Ginn K. Rotator Cuff Tendinopathy: Navigating the Diagnosis-Management Conundrum. Journal of Orthopaedic & Sports Physical Therapy. 2015;45(11):923-37. ↑ Sommerich CM, McGlothlin JD, Marras WS. Occupational Risk Factors Associated with Soft Tissue Disorders of the Shoulder: A Review of Recent Investigations in the Literature. Ergonomics. 1993; 36(6):697-717. ↑ Gaida JE, Ashe MC, Bass SL, Cook JL. Is Adiposity an Under‐recognized Risk Factor for Tendinopathy? A Systematic Review:Arthritis Care & Research. 2009;61(6):840-9. ↑ 8.0 8.1 Abate M, Schiavone C, Salini V, Andia I. 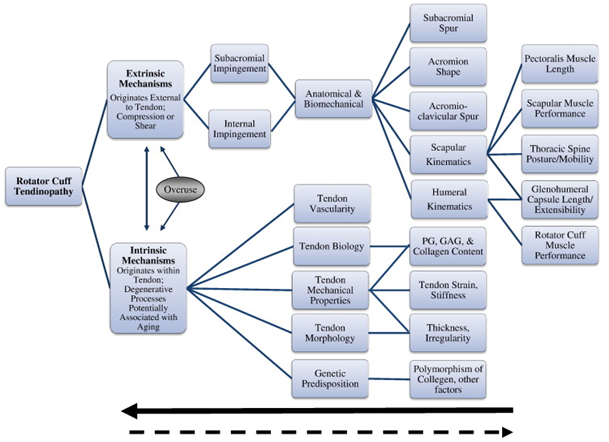 Occurrence of Tendon Pathologies in Metabolic Disorders. Rheumatology. 2013;52(4):599-608. ↑ Cohen RB, Williams GR. Impingement Syndrome and Rotator Cuff Disease as Repetitive Motion Disorders. Clinical Orthopaedics and Related Research. 1998;351:95-101. ↑ Seitz AL, McClure PW, Finucane S, Boardman ND, Michener LA. Mechanisms of Rotator Cuff Tendinopathy: Intrinsic, Extrinsic, or Both?. Clinical Biomechanics. 2011 Jan 1;26(1):1-2. ↑ 12.0 12.1 Seitz AL, McClure PW, Finucane S, Boardman ND, Michener LA. Mechanisms of Rotator Cuff Tendinopathy: Intrinsic, Extrinsic, or Both? Clinical Biomechanics. 2011;26(1):1-2. ↑ Szczurko O, Cooley K, Mills EJ, Zhou Q, Perri D, Seely D. Naturopathic treatment of rotator cuff tendinitis among Canadian postal workers: a randomized controlled trial. Arthritis Care & Research. 2009;61(8):1037-45. ↑ Silverstein BA, Viikari-Juntura E, Fan ZJ, Bonauto DK, Bao S, Smith C. Natural course of nontraumatic rotator cuff tendinitis and shoulder symptoms in a working population. Scandinavian journal of work, environment & health. 2006;32(2):99-108. ↑ Roach KE, Budiman‐Mak E, Songsiridej N, Lertratanakul Y. Development of a Shoulder Pain and Disability Index. Arthritis & Rheumatology. 1991 ;4(4):143-9. ↑ Hughes PC, Taylor NF, Green RA. Most Clinical Tests Cannot Accurately Diagnose Rotator Cuff Pathology: A Systematic Review. Australian Journal of Physiotherapy. 2008;54(3):159-70. ↑ Jain NB, Wilcox R, Katz JN, Higgins LD. Clinical Examination of the Rotator Cuff. PM R: Author manuscript. 2013; 5(1): 10.1016/j.pmrj.2012.08.019. ↑ Myer CA, Hegedus EJ, Tarara DT, Myer DM. A User's Guide to Performance of the Best Shoulder Physical Examination Tests. British Journal of Sports Medicine, 2013;47(14):903-7. ↑ Scarpone M, Rabago D, Snell E, DeMeo P, Ruppert K, Pritchard P et al. Effectiveness of platelet-rich plasma Injection for rotator cuff tendinopathy: a prospective Open-label study. Glob Adv Health Med. 2013; 2(2): 26–31. ↑ Physiotutors. Best Shoulder Pain Relief Exercises | Rotator Cuff Tendinopathy. Available from: https://www.youtube.com/watch?v=npIr82HHjXA Level of evidence 5.